A thousand wealthy individuals, whose combined worth was estimated by TheMarker at $20 billion, airlifted themselves to the tomb of the “Pele Yoetz” in a remote region of Bulgaria, where they were advised to go by the rising kabbalist star, Hasidic Rabbi Yoshiyahu Pinto. Due to my chronic lack of money, I did not have the opportunity to take that trip. But according to those who were there, Pinto walked arm-in-arm with Ilan Ben-Dov, saying, “We love Rabbi Ilan” (as we long ago learned, anyone can buy the title “rabbi,” but only with a great deal of money ). Lev Leviev, another precious Jew in more ways than one, was unable to prostrate himself on the tomb of the righteous one because his private plane was not given permission to land. The tomb had to make do with police Maj. Gen. (ret. ) Arieh Amit, singer Sarit Hadad, Deputy Minister Lea Nass, Argentine billionaire Eduardo Edelstein and many others whose very presence there made clear that if God did not die in Auschwitz, as Yoram Kaniuk wrote in “1948,” he favors the rich. Even some ultra-Orthodox Jews view the practice of prostrating oneself at tombs as idolatry, and despite the differences in our religious beliefs, it is easy for me to agree with them – especially since I found out that the graves of my grandfather’s father, uncles and cousins have also become pilgrimage sites for women who have difficulty finding a husband or giving birth. Perhaps the surprising upgrade of these tombs, to which no one in my family ascribes any righteousness, is the result of the proximity of the Halfon family’s graves to the grave of another well-known righteous person in Haifa’s old cemetery. Be that as it may, I rubbed my eyes in disbelief when one of my aunts took me to visit the site of our family’s graves, which on that day was crowded with candles and people prostrating themselves. 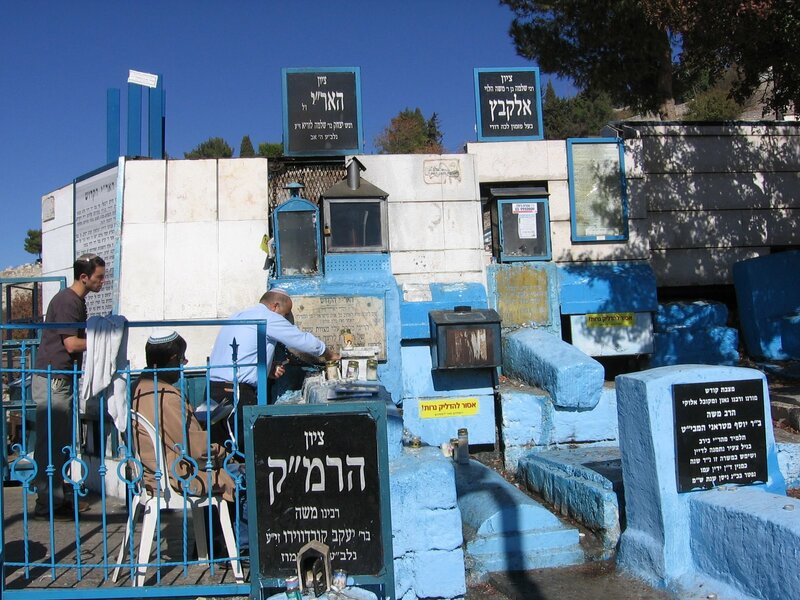 My lack of faith, righteous though I am, is bolstered by the fact that the tomb of the Spinka Gaon – who is none other than my father’s great-grandfather, whose remains were brought to Petah Tikva for burial – is also a place of prostration. And the son of Rabbi Haim Halberstam, the founder of the Sanz Hasidic dynasty, said a trip to the tomb of the Ateret Zvi – the Admor Tzvi Hirsh of Zidichov, who is my grandmother’s grandfather – is equal in sanctity to a visit to the tomb of Rabbi Shimon Bar Yochai on Lag Ba’omer. The influence of the tombs of the righteous on the European side of my family did not prevent most of my father’s ultra-Orthodox relatives from being destroyed in the Holocaust. And even among my cousins, the direct descendants of the righteous ones of the house of Halfon, there are a few who were unable to have children. Apparently, it’s all connected to the fact that my family never had enough “capital” to rub shoulders with those who have appointed themselves God’s direct representatives. On the other hand, it may be that God, from His seat on high or from His grave, loves that coward more than he loved Zeitouni and her family, and therefore he allowed Isaac to escape from Israel directly to the swimming pool in Paris, while he left Zeitouni on the road, bleeding. God help us, really. There are times when it seems that we are still living in the dark ages.